Upon his return from Miami today, Barrow was informed of Fonseca’s plan to send him a formal letter of request to repeal the law—a petition letter which the Opposition hopes will also be signed by the social partners, the unions, the business community and the churches, which have also denounced the legislation, amid assertions that it circumvents safeguards built into the Finance and Audit (Reform) Act. More than that, the Opposition has indicated that if Barrow does not repeal the bill within 21 days, it will take to the streets with a protest. While Barrow is resisting the call for a repeal of the law, he said that he “can perhaps tweak things a little” to address legitimate concerns. He said that he is happy to engage with anyone at any time, and he is prepared to contemplate “one or two things that might help to ease the disquiet” of those who are well-intentioned. Barrow posited that the Cayo North by-election in January and the municipal elections in March constituted a kind of referendum on PetroCaribe—referendums which, he said, they had won resoundingly. “We not only have now a very decisive majority in the House but we are buoyed—some people would say powered—by the verdict of the people on PetroCaribe and our governance generally,” Barrow said. “There can and will be no turning back,” he added. Barrow said that the issues raised over the PetroCaribe loan were always there, and they were there when the House met in November 2014 to pass the first set of PetroCaribe transactions in a motion presented for Parliament to approve US$114 million in PetroCaribe borrowings, retrospectively spanning September 2012 to November 2014. When the PetroCaribe Loans Act was introduced this March, it included the September 2012 umbrella agreement with Venezuela, the US$114 million in spending taken to Parliament last year, as well as US$15 million more in subsequent financing from Venezuela. Barrow said that when the UDP introduced the first set of PetroCaribe motions in November 2014, it rallied the support of 10,000 supporters at the foot of the National Assembly. That rally—which had as its mantra, “PetroCaribe, roll it!”—was in the face of a Supreme Court challenge which had just been filed by the Opposition, through Cayo South area representative Julius Espat, challenging the manner in which the Government was contracting the PetroCaribe debt. Now, the PUP says it plans to make a further claim seeking to have the court declare the controversial PetroCaribe law unconstitutional. The PUP has furthermore said that it would repeal the law if elected to office. Barrow said that the PUP are fighting against PetroCaribe because, “They see their chances fast slipping away in terms of the upcoming General Elections.” Barrow said that while the UDP sees PetroCaribe- financed initiatives as a part of the winning equation for the UDP, the PUP sees it as a part of their losing equation. The Prime Minister said that he did not introduce the law for personal reasons, but to protect the boon which he said the PetroCaribe monies have brought for the Belizean people—what he called an “extraordinarily bountiful windfall type of financing…” He said that it is unprecedented to get funding over a 25-year repayment period at a 1% interest rate. “Who can be against that except those thinking along purely politically selfish lines?” he questioned. Barrow maintained that he will not repeal the PetroCaribe Loans Act: “If they want to have their protests and their demonstration, they are free to do so. It will be absolutely pointless. 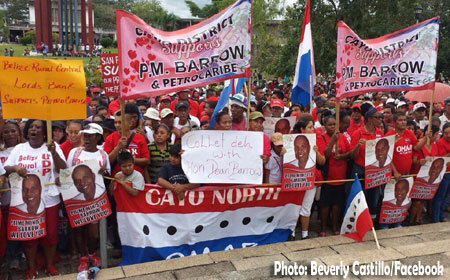 There will be no turning back from PetroCaribe,” Barrow said. The controversial PetroCaribe law not only allows Government to borrow from Venezuela without having to first going to Parliament for approval, but it also enables Government to borrow any amount and spend any portion of those borrowed funds, as long as the spending is legitimate. As we reported last week, the Government has to issue Venezuela a promissory note for each transaction, and that promissory note stipulates the terms and conditions for repayment. Barrow maintained that Government does not know and still does not know the quantum of what Belize’s indebtedness would be after any future purchase under the PetroCaribe program. He said that on a month-to-month basis, the value changes, and Government only knows what the cost of the fuel will be when it places its fuel order to fill the market demand. At last report, the government had said that its debt had reached $286 million for the period September 2012 to February 2015. That tab continues to grow with the continued importation of fuel from Venezuela, and there is no fixed ceiling for the Venezuela debt, which is now the second biggest block of Government’s external debt obligations. Financial Secretary Joe Waight told our newspaper last week that the last batch of promissory notes sent to Venezuela had a cumulative value of $30 million. Under the PetroCaribe accord, Belize’s debt to Venezuela can also be settled through bartering – such as exports of sugar to that country. Such a bartering arrangement would mean that the Government would purchase local produce for export to Venezuela in settlement of its debt obligation. “How are you going to fit that into the Finance and Audit Act?” Barrow questioned. He said that what matters is whether there is proper accounting for the spending, and whether the money is spent for good causes and to help in development initiatives and for social progress. “That is the crux of the matter, the core of the issue,” Barrow remarked. He said that the only exemption which the new law gives to the PetroCaribe financing regime is to exempt it from having to be subject to requirements for prior authorization. He said that the provisions in the Finance and Audit (Reform) Act would not apply to funds set up privately, to be administered by persons other than public officers, as is the case where a development fund is established separate from the general pool of public finances. Barrow said that there is not a problem with the Auditor General coming in whenever she feels like to audit the PetroCaribe spending.